A new exhibition opens at the British Library this week on the theme of the Indian Mughal Empire showcasing never-before-seen treasures from the era. 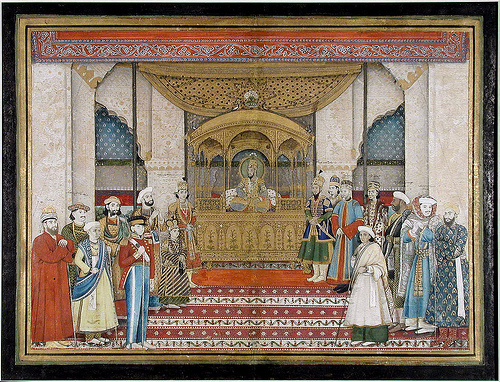 Mughal India: Art, Culture and Empire is a study of the mighty dynasty that stretched from Kabul in the northwest to cover most of the South Asian subcontinent. This exhibition is the first to document the entire period, spanning the 16th to the 19th centuries, through more than 200 objects including paintings, manuscripts and jewelry. We have quite a range of books ourselves on the subject of the Mughal Empire, its history and treasures among our art and history sections on Level 2. You are also likely to find many interesting articles on the subject among our art and design databases on Library Catalogue Plus, particularly the Art Index Retrospective and the Arts & Humanities Citation Index on Web of Science. The exhibition opens this Friday, 9th November, and runs until April 2013. To find out more about it, visit the British Library website here. 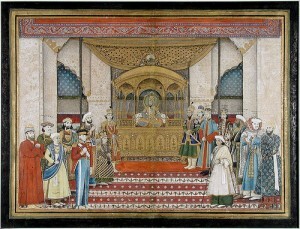 Image shows the court of the Mughal Emperor at Darbar, c.1839, from the Asian Curator at the San Diego Museum of Art, reproduced under CC License from Flickr. This entry was posted in Art, British Library, Culture, Databases, Electronic resources, History, Print resources, Resources by Steven Lake. Bookmark the permalink.